Hyundai revealed the refreshed i20 at the Geneva Motor Show. The Korean brand may be calling it 'all- new' but this is essentially a revamped model that gets the latest Hyundai look in line with models like the i40 and i30. It will go on sale this summer with prices expected to start at around £10,000. It will also have lower CO2 emissions and the option of a new 1.1-litre three-cyinder diesel engine that's rumoured to be capable of averaging an amazing 90mpg with a CO2 figure of just 84g/km - the lowest emissions of any conventional engine currently on sale. Alongside this will be a 1.4-litre CRDi 90PS diesel that emits less than 100g/km plus there will be a Blue Drive version with 96g/km. 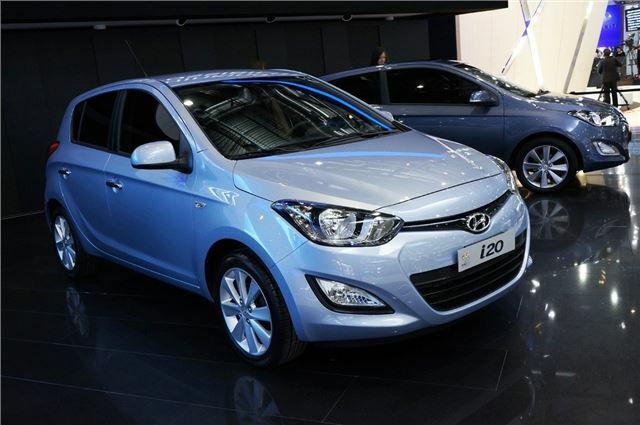 The 'new' i20 is slightly longer than the model it will replace but it's identical in width and height. The revised styling includes the now trademark hexagonal Hyundai grille and new headlights that give it a sharper appearance. There are also new bumpers, a redesigned bonnet and new wheel designs.